The CISSP curriculum covers subject matter in a variety of Information Security topics. The CISSP examination is based on what (ISC)² terms the Common Body of Knowledge (or CBK). According to (ISC)², "the CISSP CBK is a taxonomy -- a collection of topics relevant to information security professionals around the world. The CISSP CBK establishes a common framework of information security terms and principles that allow information security professionals worldwide to discuss, debate and resolve matters pertaining to the profession with a common understanding." Pass the CISSP exam with a scaled score of 700 points or greater out of 1000 possible points. The exam is multiple choice, consisting of 250 questions with four options each, to be answered over a period of six hours. 25 of the questions are experimental questions which are not graded. The CISSP credential is valid for only three years, after which it must be renewed. The credential can be renewed by re-taking the exam; however, the more common method is to report at least 120 Continuing Professional Education (CPE) credits since the previous renewal. Currently, to maintain the CISSP certification, a member is required to earn and submit a total of 120 CPEs by the end of their three-year certification cycle and pay the Annual Membership Fee of US$85 during each year of the three-year certification cycle before the annual anniversary date. With the new changes effective 30 April 2008, CISSPs are required to earn and post a minimum of 20 CPEs (of the 120 CPE certification cycle total requirement) and pay the AMF of US$85 during each year of the three-year certification cycle before the member’s certification or recertification annual anniversary date. For CISSPs who hold one or more concentrations, CPEs submitted for the CISSP concentration(s) will be counted toward the annual minimum CPEs required for the CISSP. CPEs can be earned through several paths, including taking classes, attending conferences and seminars, teaching others, undertaking volunteer work, professional writing, etc.., all in areas covered by the CBK. Most activities earn 1 CPE for each hour of time spent, however preparing (but not delivering) training for others is weighted at 4 CPEs/hour, published articles are worth 10 CPEs, and published books 40 CPEs. Experienced information security professionals with an (ISC)² credential in good standing can progress to meet requirements for (ISC)² Concentrations to demonstrate further knowledge of select CBK domains. A passing score on a concentration examination is intended to demonstrate proven capabilities and subject-matter expertise beyond that required for the CISSP. (ISC)² promotes the CISSP certification as the "international gold standard" against which other security certifications are measured. IT professionals with security expertise are often in high demand, and the CISSP is one metric by which that expertise can be demonstrated. In 2005, CertMag surveyed 35,167 IT professionals in 170 countries on compensation and found that CISSPs led their list of certificates ranked by salary, with the Certified Information Systems Security Management Professional (CISSP-ISSMP) program drawing $116,970 annually and the Certified Information Systems Security Architecture Professional (CISSP-ISSAP) earning $111,870.” A 2006 Certification Magazine salary survey also ranked the CISSP credential highly at $94,070 per year, and ranked CISSP concentration certifications as the top best paid credentials in IT, with CISSP-ISSAPs averaging at $114,210 per year and CISSP-ISSMP at $111,280 per year. These numbers correlate with compensation advantages enjoyed by IT security professionals in general, as well as with advantages accruing to the seniority and management roles that intersect with the concentration certificates. Others reveal a different opinion, mentioning that "academic qualifications support broad knowledge and skills in general, professional certifications may be effective in a limited area of operations. Academic programs exposing the students to theoretical concepts and problem solving experience are critical for preparing graduates for jobs in the information security". Two CISSP certified experts damaged Samsungs reputation in March 2011, by publishing an exceedingly poorly researched report containing false allegations. The bloggospehere has since been calling for their credentials to be revoked. ^ Harris, Shon (2010). All-In-One CISSP Exam Guide (5 ed.). New York: McGraw-Hill. pp. 7-8. ISBN 0071602178. ^ a b Tipton; Henry. Official (ISC)² Guide to the CISSP CBK. Auerbach Publications. ISBN 0-8493-8231-9. 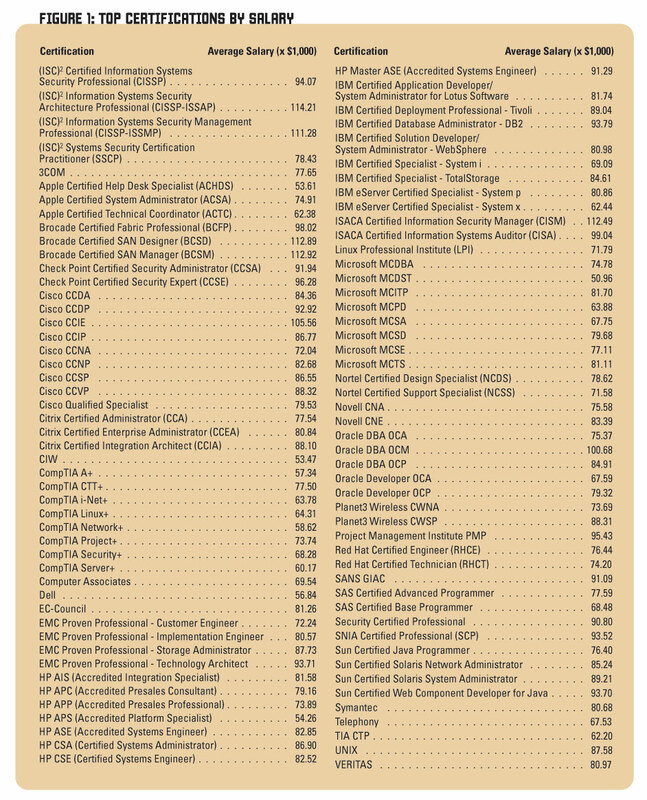 ^ “Top Certifications by Salary in 2007”. Certification Magazine. (April 11, 2007). オリジナルの2007年3月29日時点によるアーカイブ。. https://web.archive.org/web/20070329054214/http://www.certmag.com/images/CM1206_salSurveyFig1.jpg 2007年10月14日閲覧。. ^ Sosbe, Tim; Hollis, Emily; Summerfield, Brian; McLean, Cari (December 2005). “CertMag’s 2005 Salary Survey: Monitoring Your Net Worth”. Certification Magazine (CertMag). オリジナルの2007年6月7日時点によるアーカイブ。. https://web.archive.org/web/20070607155757/http://www.certmag.com/articles/templates/CM_gen_Article_template.asp?articleid=1524&zoneid=224 2007年4月27日閲覧。. ^ Hentea, Mariana; Dhillon, Harpal and Dhillon, Manpreet (2006). “Towards Changes in Information Security Education” (PDF). Journal of Information Technology Education 5: 221–233. http://citeseerx.ist.psu.edu/viewdoc/download?doi=10.1.1.107.2077&rep=rep1&type=pdf. ^ "". Networkworld.com. Retrieved on 2011-04-03.